Learn about more restoration schemes in the Border Uplands area. In addition to our Blanket Bog project, we are currently on a number of other restorations. These span across the Park, throughout various terrain, but all look to preserve and create habitats for species living in Northumberland. Upland heathlands are important for the populations of breeding birds they support. These include species such as curlew, snipe, black grouse, ring ouzel, redshank, red grouse as well as birds of prey such as merlin and hen harrier. Upland heathlands may also support a range of specialised invertebrates such as the mountain bumblebee [Bombus Monticola] which has suffered a dramatic decline in the northeast. Heavy grazing, especially by sheep, leads to the suppression of small shrubs – and eventually heathland would convert to grassland. Drainage of heathland sites reduces the number of species it can support. With the help of volunteers, we have organised heather seed scattering on vulnerable peat sites where we are trying to restore the vegetation cover. To mimic the way that seeds disperse naturally, this sort of practical work has to be done around October. The heather seed was collected locally, by a conservation contractor. We have drafted moorland burning plans for two estates. They illustrate to land-managers the areas that could technically be burnt and whether it is on a 10 or 15-year rotation. All the sensitive habitats are taken off the maps. We also helped on the ground by co-ordinating retained fire-fighters to come along on the day of the burn. This is partly useful for the fire-fighters who get real practice in managing moorland fires. And it is also really useful to have all the extra skilled manpower on site. 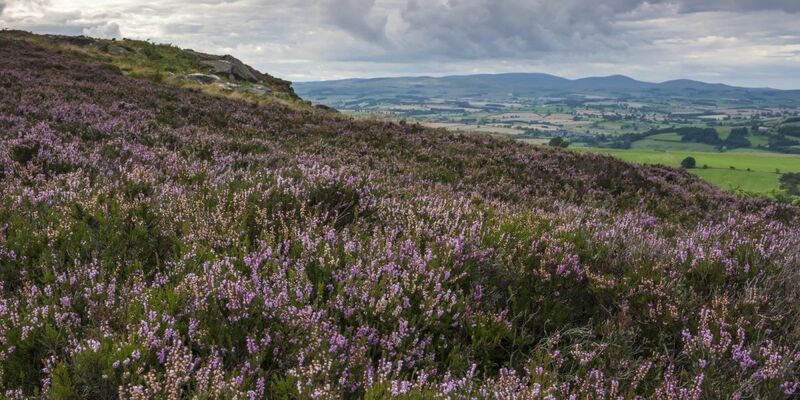 We have also organised volunteer days to collect and scatter heather brash, or scatter locally-sourced heather seed, on Simonside. The seeds and brash were put on an area of bare peat that used to be a desire line, before a proper public footpath was designated along the ridge. We will monitor how the heather does on the ground over the coming years. Upland hay meadows are a rare habitat nationally. Upland hay meadows have been formed as a result of traditional hay making in the short growing season. As a result, they develop a mix of species that is more closely related to the mountains of the Alps or Scandinavia. Species would include sweet vernal grass, wood crane’s bill, great burnet, lady’s mantle and pignut. They are also an important nesting site for breeding birds, such as lapwing. They are also interesting because some plants are shade-tolerant and so are also woodland edge plants, while other plants like a lower sward. Most examples of hay meadows are on enclosed farmland but fragments do exist on roadside verges and river banks. The existing sites are generally small, and the project aims to improve the condition of existing meadows and to create or link up new areas. Another factor to consider is to provide nectar for pollinators from early spring (when queen bees start to emerge) through to late autumn. Willow is a good early nectar source. Pressures on the habitat include applying fertilizers or slurry, changing the cutting or cutting regime (which affects how plants set seed and impacts on nesting birds), or over grazing. 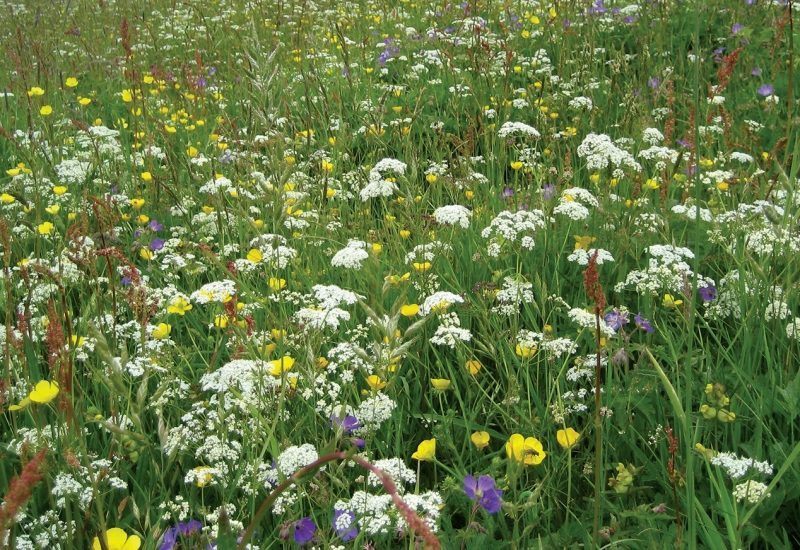 Working with Natural England’s stewardship advisors, over the past few years a total of 15 farms have had some help with the seeding of their species-rich grassland or meadow sites. This totals just over 127ha. Seed is collected locally wherever possible. We also co-ordinate surveys of these sites in future years. We also organised a survey of the verge of the C200 road which runs around the south side of Kielder reservoir – Europe’s largest man-made reservoir. The survey was funded by the Rees Jeffrey Road Fund and by Northumbrian Water’s branch out fund. The aims of the survey were to assess each parcel for its value to pollinators, and to make recommendations about any scrub removal that may be required. The whole verge is 19 miles long and totals 43ha of corridor useful for pollinators, like the mountain bumblebee. At the same time, we gathered information from may local groups and communities in and around the National Park who identified flower-rich verges of their own. We hope to secure the management of these – specifically through the timing of the summer verge cutting. We have also worked on some mapping thinking about how fragmented the meadows are in the landscape and what could be the stepping stones or corridors between the most fragmented sites. We have worked with Buglife to map B-Lines in Northumberland, and our partners in the wider Northern Upland Chain Local Nature Partnership – to map ecological networks of grassland habitats. Over the years, many naturally wet areas on farms would have been drained so that natural hollows and pools had been filled in or dried out. They can make a big difference to wildlife on farms. They are rich in insects and earthworms and support a wide range of plants. Wetland birds such as snipe and lapwing can benefit hugely from creating wader scrapes – for food and for refuges or nesting. 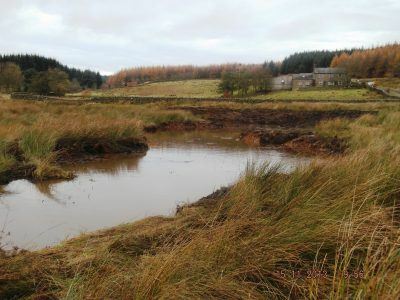 A scrape is a shallow pond which ideally holds water seasonally but remains damp for most of the year. See above. It is like a shallow depression – obvious in a field – with gently sloping areas. A wader scrape simply mimics a natural hollow where water would accumulate. Scrapes don’t have to be in the middle of a field, they can be good habitats for wildlife if they are on the edge of an existing ditch for instance. 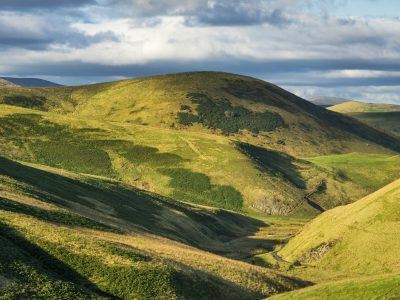 The RSPB is one of the partners in the Border Uplands project and is working with farmers and land managers in the area to identify suitable spots and give advice. The RSPB surveyed four farms, as part of their Higher Level Stewardship, and made recommendations with upland nesting birds in mind. 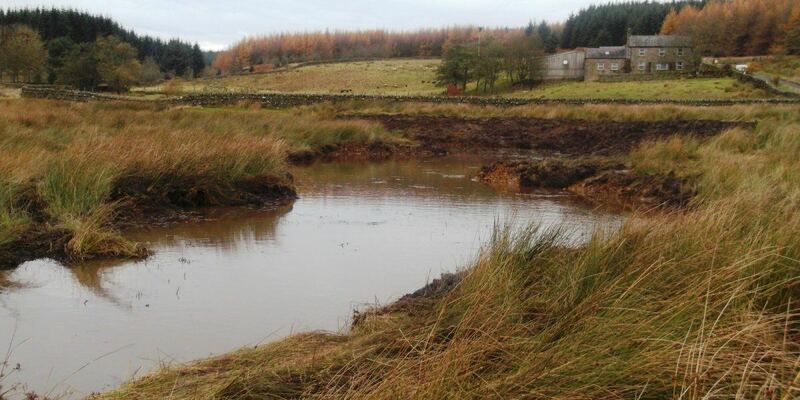 Then we coordinated the creation of wetland scrapes and even a small pond on a local farm. Just as the digger was leaving having built up the pond bund, and it was already filling with water, two herons flew in, already checking out the new habitat! At the same time, we organised for two local farmers to go on a wetland scrape site visit, kindly hosted by RSPB in Solway, Cumbria. The pond was approx 1,000m2, plus 2 scrapes approx 400m2. There are other sites planned for the future. Typically in Northumberland, woods are small fragmented blocks on steep-sided valleys. Linking up patches of existing woodland can help species move about the landscape and help the linked woodlands be more resilient to climate change. For instance, a hedgerow or a small area of trees planted alongside a stream has great benefits for wildlife. Many bird species benefit from woodlands as a food source and cover for nesting – for instance redstart, wood warbler and pied flycatcher. The right tree species planted in the right places, say, to help stabilise a bank, can help regulate water flow and water quality further downstream. 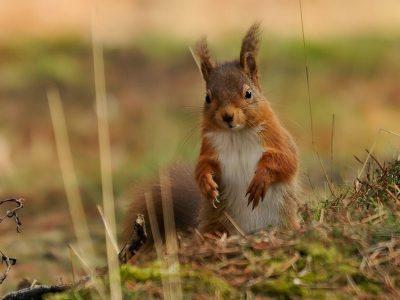 Areas of woodland can also be a potential long-term income for landowners as well as providing shade and shelter for animals. Woodlands can form a mosaic of upland oak woodland with varying amounts of holly, rowan and hazel as the understorey, through to wet woodlands dominated by alder, birch and willow. Such woods are also often rich in lichens and ferns. Lichens especially like the clean air. The Forestry Commission and Natural England are part of the Border Uplands partnership, and areas of woodland restoration or creation are being discussed with land managers. Since 2012, about 63 ha of new native woodland agreements have been agreed – either through the England Woodland Grant Scheme or through Higher Level Stewardship. We have also worked on maps to illustrate how connected or fragmented broadleaved woodland is in the area, with an indication of where could be good tree planting sites on a farm, ready for talking through with land managers out in the field. This links to the work of the Northern Upland Chain Local Nature Partnership. 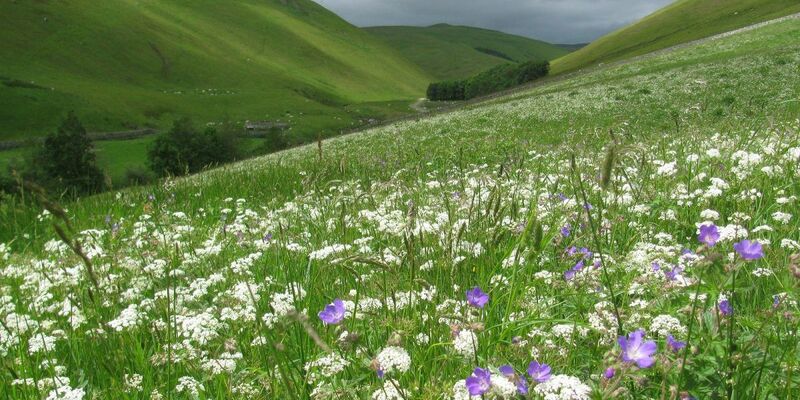 Learn more about our work in the Border Uplands area. Find out how we are protecting our valuable bog habitats.